1.Open the package and fix the clip around the plant. 2.Connect the wires and select one of the three independent switches as required. fluorescent lamps.The best part is it works on standard light sockets so you do not have to purchase any special housing for the bulb. satisfied.Welcome asking for a wholesale price if you want. THREE 15W LIGHTS HEADS:There are three 15w light heads in one light including red light 620mm and blue-ray 460mm. The laboratory has verified that these LED lights design has a significant effect on accelerating the growth and development of plants. 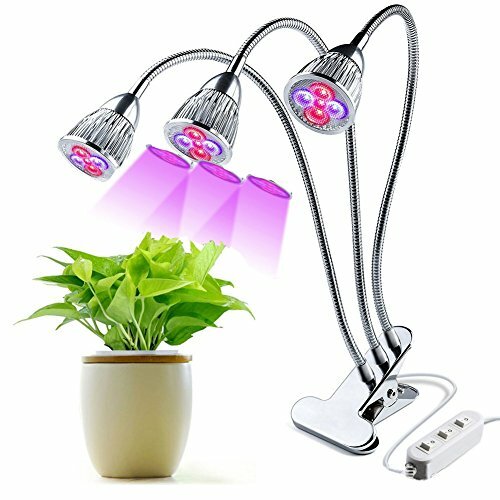 ROTATABLE LIGHTS HEADS:Our plants growing lights are equipped with big clip to make the whole lights heads 360 degree rotatable and adjustable.You can fix the entire lamp through the fixing clip to adapt the best growing position of plants. HIGH CONVERSION RATE:The lamp's service life can reach 50,000 hours.One hour consumes only one degree of electricity. High light efficiency and low heat generation can make 90% of the electrical energy converted to visible light to support plants. SUITABLE OCCASIONS:Suitable for indoor plants seedlings, hydroponics greenhouse garden home and office, potted plants, succulent plants, foliage plants and flowering plants. SAFE AND ECO-FRIENDLY:Our light line is healthy without radiation harmful elements and without containing ultraviolet and infrared rays.Small required voltage and current make sure it is safe. DC drive without strobe make them can protect eyesight effectively. If you have any questions about this product by Aquarius CiCi, contact us by completing and submitting the form below. If you are looking for a specif part number, please include it with your message.